I get into stupid arguments with myself all the time about really mundane topics. Is it OK for a band to put a picture of themselves on the cover of an album? Is it really OK to have a singer that doesn't play an instrument? Can a song still be good if it fades out as opposed to just ending? Will someone burn in hell if they don't wave at me if I let them in front of me in traffic? None of these are particularly important and never actually stop me from enjoying a record, but they're the sort of weird things that pop into my head from time to time. Another of these is wondering how many songs are needed to call something a full length. Is it based on the number of tracks or is it based on the running time of an album? I tend to think that your record needs to have ten tracks to be a full length, unless it's eight or nine songs and has a few really long ones (which I don't recommend unless you are Drive Like Jehu). 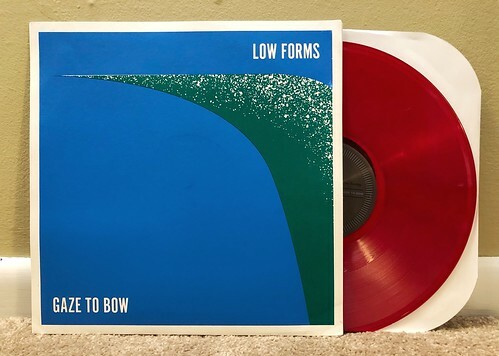 This brings us to Low Forms, who have released a record with seven songs. A few of them are in the neighborhood of five minutes, but there aren't any crazy long opuses here and the speed for the record is 45rpm, not 33. So is this a full length or not? And why do I care? I can't answer those questions, but I'll just say that I'd feel better about calling it a full length if there were three more songs. That's a lot of rambling without actually talking about this record which is split into two thematic sides. The A side is Gaze To Bow and features two upbeat and punchy songs. The first one "Idle Hour" is probably my favorite on the album. The second, "De La Grave," is pretty good, but does go on a pretty long instrumental detour. Side A ends with "Gaze To Bow." This one is four minutes long, but it feels like it's about fifteen or so with its slow droning feel. It had me worried about side B, The Watchful Eye. Luckily things pick up again with "Rope Store," a song that is catchy, though has something of a country-fried feel to it. I think it's that lead guitar twinkling. The other songs on this side are all pretty good and mostly keep to fairly traditional rock and roll songs, appropriate to sing in the dive bar of your choosing. All in all, this is a decent little 12". It's nothing that blows me away, but there's also nothing bad on here aside from that "Gaze To Bow" song. That one's a little rough.